Preface. I. Introduction and Overview. Introduction: progress in understanding continental rifts (K.H. Olsen, P. Morgan). Mechanisms of rifting: geodynamic modeling of continental rift systems (M.H.P. Bott). II. Methods of Investigation: Multi-disciplinary Perspectives. Petrology,geochemistry, isotopes (R.F. Wendlandt et al.). Seismic techniques (L.W. Braile et al.). Potential field methods (M.H.P. Bott, W.J. Hinze). Heat flow in rifts (P. Morgan). Practical magnetotellurics in a continental rift environment (G.R. Jiracek, V. Haak, K.H. Olsen). III. Modern Rifts. The European Cenozoic rift system (C. Prodehl, St. Mueller, V. Haak). The East African rift system (L.W. Braile et al.). The Rio Grande rift (W.S. Baldridge et al.). The Basin and Range province (T. Parsons). The Baikal rift system (G.R. Keller et al.). IV. Paleorifts. The Oslo rift (E.-R. Neumann, K.H. Olsen, W.S. Baldridge). The Midcontinent Rift System, U.S.A.: a major Proterozoic continental rift (D.J. Allen et al.). Rifted passive margins (M.H.P. Bott). The Southern Oklahoma Aulacogen (G.R. Keller, W.S. Baldridge). West and Central African rift system (G.R. Keller, R.F. Wendlandt, M.H.P. Bott). V. Epilogue. Continental rifting: a final perspective (W.S. Baldridge, G.R. Keller, L.W. Braile). Subject index. This multi-author book has been prepared by an international group of geoscientists that have been active in rift research since the late 1960s. In 1984, an informal, grass-roots study group was initiated to compare individual research results and to explore in greater depth the apparent differences and similarities in the interpretations from various rift systems. The group became known as the CREST working group, an acronym of Continental Rifts: Evolution, Structure and Tectonics, which not surprisingly became the title of this book. 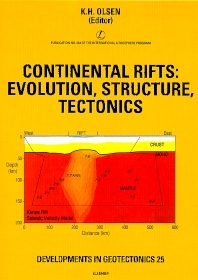 Continental Rifts: Evolution, Structure, Tectonics presents an overview of the present state of understanding and knowledge of the processes of continental rifting from a multidisciplinary, lithospheric scale perspective. The chapters have been structured on each rift system in approximately the same synoptic sequence, so as to facilitate comparisons of rifts by the reader. The book complements its predecessors by presenting a more unified picture. It succeeds in presenting the status of a representative majority of the continental rift systems that have been at the forefront of recent research. For students and experienced researchers alike, this book will be of significant value in assessing the current state of knowledge and in serving as a framework for future research.